Jesus Christ went about doing good and healing all who were oppressed of the devil (Acts 10:38). He preached an uncompromising truth. He stood against the religious leaders who wanted Him to conform to the religious system they had created. It was a system based upon status and pedigree. It was a system insulated by laws that guaranteed outsiders would remain outside. It was a system that “had a form of godliness but denied the power thereof.” They had religion without relationship. And Jesus Christ railed against it. The religious leaders called Jesus Beelzebub, not just a devil but the chief of devils; they saw Him not as Christ but as antichrist. They pretended to love Him just long enough to find a way to destroy Him. Inwardly they hated Him and all He stood for. Fire would come from their nostrils after they tried to entrap Him and lost. Spiritual wisdom trumps earthly wisdom all day every day. What do religious folk call you? Those with religion and no relationship, are you expecting them to call you friend? If you are seen as their friend somehow you have compromised the gospel. The sheep look to the shepherd but goats look out for themselves. The sheep love the shepherd but the goats buck and try to bite the shepherd. You have no friends among goats, only selfish people who are concerned about themselves. If they hated Jesus Christ and they did, you will be no exception. Get used to pain; learn to suffer as Christ did because you cannot separate the sheep from the goats. You will not be popular with everyone but someone will love you back. God will see to that. Amen! This entry was posted in Spirituality and tagged Discipleship, faith, Fame, Goats, Jesus, Opinions, Popularity, salvation, Sheep on January 30, 2014 by Earl J. Griffin, Sr..
People in this world need someone to acknowledge that they exist. Rene’ Descartes is noted for his saying, “I think therefore I am.” As true as that statement is, it is worthless without acknowledgement of another human being. We should note that Descartes used his interaction with people to develop his own unique views about life. In terms of leadership and organizations, each employee needs to know that its leaders know they are on the job. Therefore, a leader has to find ways to acknowledge each employee. John Maxwell tells the story of an apprentice preacher in his organization. One day the preacher came into the office and although other employees and members of the church were in the foyer and mingling around the office area, this apprentice preacher, this would be leader, marched right past them without speaking or acknowledging their presence. John says he called the young preacher into his office to discuss his actions. He asked the young preacher why he had not bothered to acknowledge the people present on his way into his office. John said he told him, he was busy and had a lot of work to do and just wanted to dive right in. John remarked, “Those people you just ignored are your business.” Leaders should remember at all times that people are the most important asset in any organization. According to Robert Slater (2003), one of Jack Welch’s leadership secrets is “Nurture employees who share the company’s values” (p.23). In other words, a leader has to ensure that those employees and managers who embrace the company’s goals and visions are acknowledged and affirmed in some way. According to Welch, “Give employees more responsibility, and they will make better decisions. By making your employees more accountable, you make your organization more productive” (Slater, 2003, p.25). Leaders should use both spontaneous and systematic methods of acknowledgement to recognize its employees. But above all, a friendly greeting is crucial when leaders interact with employees at every level. “I think therefore I am” means little if no other person acknowledges that fact. I urge leaders to ensure they acknowledge those who both support the team and those who do not. Each person is valuable in their skin. Even when they don’t support your efforts, you should still value their existence. Even when hard decisions are necessary regarding their position or continuance with the company, you should treat them with dignity and respect and thank them for the contributions they had made up to that point. De Pree, M. (2004). Leadership is an art. New York, NY: Doubleday. Slater, R. (2003). 29 Leadership secrets from Jack Welch. New York, NY: McGraw-Hill. This entry was posted in Leadership Development and tagged development, goals, leadership, motivation, rewards, vision on January 23, 2014 by Earl J. Griffin, Sr.. But don’t you just love it anyway. Hope is an outstretched neck poised with anticipation of what will happen. You know something wonderful, something adventurous, something new is coming. It is not frivolous; it’s based on a plan that you’ve implemented and you’re working diligently to see come to fruition. You hope inwardly, silently, and then with outward jubilation because you just know. Hope is powerful indeed; it chases depression, attacks despair, and exterminates doubt. What are you hoping for based on what you’re working toward? Promises have been made, collaborations have been formed, all that remains is accomplishment of the dream. Emily Dickinson said, “Hope is the thing with feathers that perches in the soul and sings the tune without the words and never stops at all.” I’m singing because I just believe something good is about to happen! Can’t you sense something on the horizon? Sing a new song; it’s 2014 – hope, believe, dream, let it capture your soul! 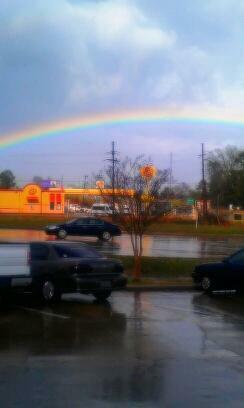 The rainbow shouts, “It’s not over yet! Sunshine is coming!” So perk up, dance, and sing. You’ve got another chance. Barbara Kingsolver said, “The very least you can do in your life is figure out what you hope for. And the most you can do is live inside that hope. Not admire it from a distance but live right in it, under its roof.” I totally agree; live in hope based on faith that your work will reap a great harvest. Dare to Hope in 2014! This entry was posted in Spirituality and tagged belief, depression, diligence, faith, goals, hope, inspiration, joy, love, peace, trust, vision, work on January 8, 2014 by Earl J. Griffin, Sr..